Even though they will eventually fall out, your child’s temporary teeth are critical part of their oral and general health. And, just as in the case of adult teeth, temporary teeth can suffer from cavities. Tooth decayin infants and toddlers is known as “Baby Bottle Tooth Decay”, or if you are a dentist, Early Childhood Caries. Unfortunately, this decay can lead to long-term damage to an infant or toddler’s health. It’s important to give infants good oral care to help protect their teeth for the lifetime ahead of them. At Ria Family Dental we want you to know everything you can about the threat of Baby Bottle Tooth Decay, so you can work with us to defeat it! We’re giving you 7 tips to avoid baby bottle tooth decay. Baby bottle decay is regular tooth decay, but in the mouth of a child. Typically, baby bottle tooth decay affects the front upper and lower teeth, but this does not mean it doesn’t occur in the teeth that are further back. Why Worry About Baby Bottle Tooth Decay, After All The Teeth Are Temporary? The first issue is avoiding dental work. Severely decayed teeth may need to be extracted, despite the fact they are not permanent. And loss of temporary teeth can have negative effects including bad eating habits, speech problems, misaligned teeth, and damaged adult teeth. Healthy baby teeth, on the other hand, tend to result in healthy permanent teeth. Speech Development: Have you ever listened to someone who was missing teeth, particularly front ones, try to talk? If your have, you know how much we need teeth in order to speak clearly and properly. This is because properly aligned teeth make speaking easier. And this is true for infants as well. Infants with healthy, well spaced, and more-or-less aligned teeth tend to have the ability to form words and speak clearly. Children with unhealthy, poorly spaced, and misaligned teeth often don’t speak properly, and the bad habits they pick up at a young age can follow them through life. Tooth alignment and position of permanent teeth: Baby teeth function as space-holders for adult teeth and serve as guides for the adult teeth as they erupt into position. If a baby tooth is missing, no matter what the reason, nearby teeth can slide or tilt into the gap. When this happens, a permanent tooth has less room to enter the smile and its eruption can even be completely blocked. Baby teeth make proper chewing and eating easier: In addition to reducing solid foods to swallowable and digestible pieces, chewing correctly has other valuable outcomes. 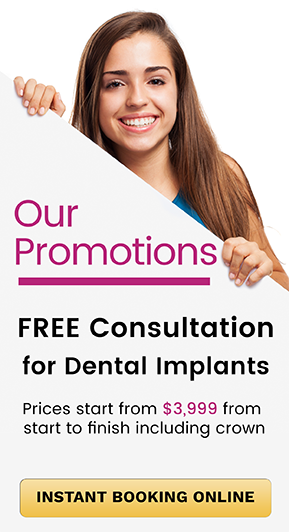 Tooth loss and/or poor alignment issues can lead to additional stress on the jaw and cause complications, and chewing problems can also interfere with the development of key facial muscles. Improper chewing can even lead to poor nutrition! The good news is that parents can do a number of things to decrease the risk, and even prevent, baby bottle tooth decay. Never put a child to bed with a bottle of milk or juice, no matter how much easier it makes the bedtime routine. Decreased saliva, activity, and swallowing means that the liquid sugar will stay on the baby’s teeth for hours, eventually causing decay. If your child needs a bottle to fall asleep, fill it with water. Don’t let your child carry bottles of juice or milk with them. Consistent access to sugary liquids leads to the bad habit of constantly sucking on the bottle, and sugar coating the teeth. Try to never fill bottles with soft drinks, juices, or sugar water. When your child is about 6 months old, begin to move them to drinking from a cup. 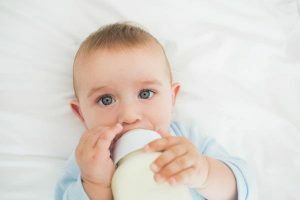 By 12 to 14 months a baby with experience drinking from a cup will have an easier time transitioning and weaning off the bottle. Don’t allow extended pacifier use and never put syrup or honey on a pacifier! In fact, NEVER give honey to a baby under 1 year old! Honey is not safe for infants. Restrict the amount of juice a child consumes and promote healthy eating habits by limiting sweets. Start cleaning your child’s mouth even before teeth come in. Wipe the gums off after each feeding with a warm, wet washcloth or a dampened piece of gauze wrapped around your finger. You can also buy thimble-like, soft rubbery devices (they fit over your index finger) to use for rubbing off excess food.